When people decide to buy reptiles for pets, some inevitably cross the line of safety and wisdom. Although it may seem thrilling to own a pet that is harmful, it's best left up to the experts and people who are trained to preserve wildlife. Underestimating a dangerous reptile can mean a quick and certain death to the uneducated and careless pet owner. But if you're determined to own a dangerous reptile, at least make sure you are aware of all the possible safety precautions. Be fully informed as to what steps to take should you incur injury from contact with your pet. A pet may harm an owner for several reasons. A reptile has instincts that are inbred. If you make the mistake of smelling like food, you will be in danger of being mistaken for food. There's also the danger of underfeeding your reptile and having them strike out in desperation from starvation. If you startle the reptile, you're likely to be harmed. If the reptile is injured or ill, the pain may cause them to strike out. 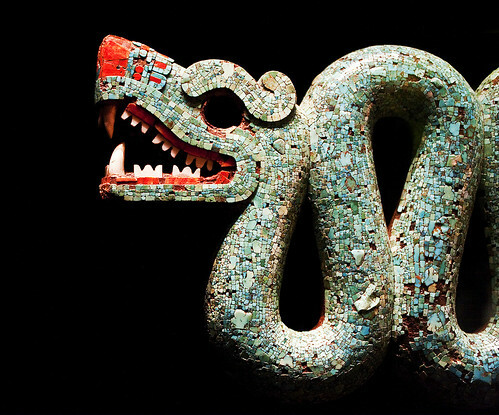 Although it is easy to want to blame the reptile, you must take into account the reasons it may have chosen to bite, scratch, or otherwise harm someone. Neglect to keep the cage, terrarium, or other enclosure secure at all times is crucial to your safety and to the safety of the reptile. Some snakes have teeth, some have venomous fangs, and some have constriction to use as weapons. Whatever the case may be, you can be certain it will be painful to the recipient. Vipers and rattlesnakes are two dangerous snakes that use their poisonous fangs to inject venom into their prey or attacker. Vipers can grow as long as 6 feet and don't need daylight to attack. The pits between their eyes and nostrils alert them to their prey. A beautifully dangerous reptile, the golden eyelash viper is a bright lemon yellow color. Snakes aren't the only dangerous reptiles, nor are they the only dangerous reptiles chosen for pets. Crocodiles and caymans are also big predators. They latch onto their prey with their many teeth and powerful jaws, and then they drag the larger victims underwater to drown them. Crocodiles have been known to gobble snakes for treats! American alligators can be seen in many museums or zoos, live in exhibits. Well known in the deep south of Louisiana, they are not only predators but also are hunted for food and to be cut up into trinkets sold to tourists. The alligator disguises itself as a log in swamp water and is camouflaged very well. They live in swamps and bayous from Texas to North Carolina. Florida has an abundance of inland water that provides a perfect habitat for these reptiles. Their diet of fish, birds, and small animals along with their size and vicious capabilities make them unwelcome to most as pet material. Their habitat is hard to create as well. You can tell the difference in crocodiles and alligators by the shape of their snouts and the way the teeth lay when the jaws are shut. The alligator is able to conceal its teeth inside its mouth while the crocodile is not. Removing excess waste is one of the main challenges to a successful reef aquarium. It's often easy for beginners to forget that corals are living animals that excrete waste. Ammonia, nitrite, nitrates and phosphates are problematic to corals, fishes, inverts and other animals. An increase in ammonia that is not quickly removed or converted can easily crash a reef aquarium. High amounts of nitrates and phosphates can hinder coral growth and cause discoloration. Typical means of removing nitrates and phosphates involve water changes, skimmers and the use of macroalgae. All three are very effective but the use of macroalgae is the easiest and most economical. Skimmers are often expensive and require cleaning few times a week. Water changes are time-consuming and can get expensive for large reef aquariums. Macroalgae can effectively absorb phosphates and nitrates as long as a light source is present. The only maintenance required is pruning excess growth once a month. While skimmers and water changes incur costs, excess trimmings of macroalgae can often be sold. A side effect of excess nutrients is an increase of nuisance microalgae. Microalgae can ruin the beauty of a reef aquarium and suffocate corals. The good news is that macroalgae are able to able to starve microalgae of nutrients and thus greatly reducing its presence. There is an abundance of choices of macroalgae that include Chaetomorpha, Caulerpa, Gracilaria and Ulva. In terms of phosphate and nitrate absorption, Caulerpa is the most aggressive and effective. However, Caulerpa can be potentially dangerous. Caulerpa can suddenly dissolve and release toxic elements and the excess nutrients that were absorbed. This happens when Caulerpa is lacking light or nutrients. A second problem with Caulerpa is its holdfast roots. Caulerpa has the ability to attach itself to hard objects making removal extremely difficult. With these risks, it's better to choose other macroalgae. Chaetomorpha is an excellent and likely most popular choice among reef aquarists for nutrient uptake. Although the nutrient absorption rate for Chaetomorpha is not as aggressive as Caulerpa, it doesn't pose any risks that Caulerpa does. Chaetomorpha will not dissolve suddenly when starved of nutrients or light. There will be plenty of time and signs before Chaetomorpha dissolve. Chaetomorpha also lacks the ability to attach to objects making removal very easy. Long-term control of excess nutrients is essential for a successful and beautiful reef aquarium. Although skimmers and frequent water changes are extremely effective in removing excess nutrients, macroalgae are the easiest way to remove excess nutrients. Keeping Goldfish can be a fun and rewarding hobby. As with any new hobby, especially one that involves living creatures, always consider the maintenance that will be involved. 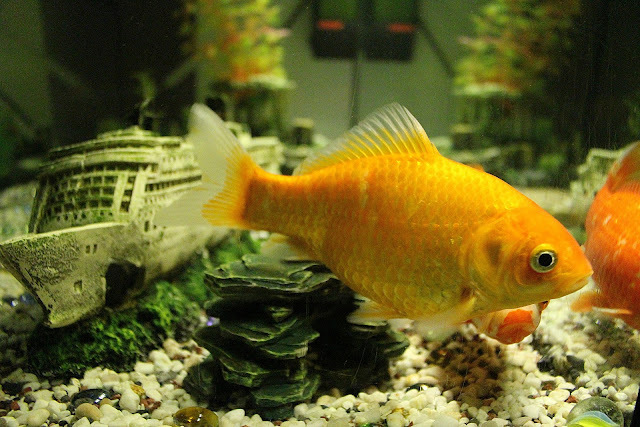 If you care for your aquarium properly, you will be sure to have happy and healthy Goldfish for many years. Goldfish have a life expectancy of five to ten years. If you do a good job maintaining their fish tank, you should have fun, beautiful fish for a long time. Make sure to feed them correctly and keep their water fresh and clear. When starting any new aquarium, you should get everything in place before buying the fish. If you are going to put gravel on the bottom, you may want to put only a thin layer. This will make it easier to keep clean, as Goldfish tend to be messy. Make sure that you rinse the gravel thoroughly before placing it in the bottom of the tank. If you have some decorations, you should add them now. Make sure that you rinse them well before putting them into the tank. Also be sure that the goldfish have plenty of room to swim, as they as active fish. Give them a place or two to hide, and that should do nicely. Now that you have everything in place, you can add to the water. You will need to use a dechlorinator, as the chlorine in tap water is poisonous to fish. Once the fish tank is filled up, you can turn on the filter. Change it as often as recommended to keep your fish healthy. Goldfish live at room temperature so you will not need a heater. They are quite comfortable in temperatures from 68 to 80 degrees. However, they should not be exposed to rapid temperature changes. You might want to let the filter run in the new goldfish tank for a day or so to filter out any chemicals or dyes that might have been left on the gravel and decorations that you just added. Waiting to buy new fish can be one of the hardest things about fish keeping! You need to add fish gradually. Fish excrete ammonia. If you add too many fish at once to a new fish tank, the water will not be seasoned enough to dissipate it. As the water in your Goldfish tank ages, it builds up beneficial bacteria that turn harmful chemicals excreted by the fish into harmless ones. However, this will take some time. Start out with only one fish. The nitrogen cycle will not begin until you add the fish, so running an empty tank for several days will not help. Since your fish tank is brand new, you might want to consider making partial water changes of about 25 percent of the total water volume every few days for the first week or so. You can find Goldfish food at almost any pet shop. Make sure to purchase some when you buy your first fish. Feed only a small amount. Especially at first. Any uneaten food will sink to the bottom and rot. Keep this to a minimum. Watch your fish for the first few times that you feed them. Feed only as much as they will eat in two to three minutes twice a day, or as recommended on the Goldfish food label. Be especially careful not to overfeed when the Goldfish tank is new. This will cause an excess build-up of toxic chemicals and can kill your fish quickly. As the water in your fish tank cycles through the nitrogen cycle, you may notice that is becoming very cloudy. This is a normal process and should clear up in a few days. Do not add any new fish until the water is crystal clear again. Clear water will signify that the nitrogen cycle is working and that the toxic chemicals are being converted to good ones. Remember that Goldfish will grow large and they need a big space. Don't overcrowd the tank if you want to keep healthy fish. If you follow this little guideline, you will be sure to have a healthy goldfish aquarium. AQUARIUM FISH death: precautions of young aquarist. Another thing to watch out for in a newly installed tank is the quantity of food: very little of this should be given during the first three weeks. Mind you! I am not suggesting that you should not give them food at all, because without food, no bacterial flora forms. The food supply to the bacteria should be increased only very gradually. Fish keepers with old functional aquariums should avoid general cleaning that is washing of sand/gravel, scrubbing of the tank wall and complete water changes so as not to disturb the bacterial flora. When you have to service, it should just be the removal of the mulm and dead leaves sufficient to ensure adequate flow through the filter and no more. The bad habit of replacing the entire filter material or the soiled part with fresh materials is detrimental to fish life. Most bacteria live in the sludge at the bottom of the tank, so don't throw them away. Many pet shops that operate a house-to-house maintenance routine on aquariums are used to the habit of a complete overhaul which invariably lead to fish death. I have met many people who have said, "I used to service my tank myself. On close scrutiny, I discovered that he indulges in the unforgivable habit of washing the aquarium with detergents! In real life situation, no one can attest to having experienced a complete overhaul of a river bed. The only thing that happens during heavy rains or flood is the partial/complete change of the water body. The bed, sand and gravel components get cleaned but not overhauled. This is nature's method of 'servicing' the fish's natural environment. So why don't we all adopt nature's method? Professional aquatic pet dealer’s service aquariums in the same way, and to the committed aquarist, I will advise you to do this yourself! Buying discus fish for your aquarium should be pretty much the same as buying any other fish, yet it seems to give people all sorts of worries and anxieties, possibly because of the amount of money involved. Not many other fish has the price tag that Discus Fish has attached to them. The main thing is that you have carried out your homework, so you know about the fish and their requirements, what to look out for, and what questions to ask, in order for you to be able to make a right decision. This may seem like common sense - but some people fail on this - and make costly mistakes! Next - remember you're not in a race! If you are up against time or competition to get the fish you want, put down a deposit to get the vendor to keep hold of it for you, or let it go. Don't let yourself be pressurized into making a hasty decision. When you feel you've got these bases covered - you're ready to go! So where do you go? Discus Fish are generally available from 3 sources: Importers/Dealers, Pet shops and Home Breeders. If you're a beginner - whether you never had discus before or are starting as a fish keeper in general - always go to the specialist shops. There are two reasons for this. They have a bigger selection of fish which means you are more likely to find something to suit you, and they have specialist knowledge for you to draw from at the time of purchase and after. For the more advanced Discus Fish keepers - by all means, try other avenues - but take care. While the fish may come at less of a premium - you'll often find that the quality of the stock isn't always all it's cracked up to be. So what do you need to look out for? Most people will tell you to search for Discus Fish with perfectly round shaped bodies and small bright eyes. Even though this is correct - there's more to it than that. Apart from finding the fish with the colour/pattern (don't worry too much about their names as these tends to vary from place to place), it's important that you spend some time watching the fish closely and monitor their behaviour. Healthy Discus Fish should be bold and alert, and not shy away from the front of the tank. Do not go for fish that hideaway at the back of the tank or behind plants etc., as that is a sign that something is not quite right. As far as bodily defects are concerned, the things to be on the outlook for is fish that seems to be breathing heavily, fish with twisted mouths, poorly shaped fins and tails, odd or big eyes and short gill covers. These are all signs of poor breeding practices. Also, you should not look at the fish themselves only. It's equally important to look at the bottom of the tank, to see if you can see any of their waste. Discus Fish pass their faeces regularly, and it the fish are healthy it should be black in colour. If they're white or clear this indicates that the fish may have intestinal worms or similar internal problems, in which case you shouldn't buy them. So what about the questions to ask the dealer? Well - first and most importantly - ask if you can see the fish feed. Healthy discus should, though they are slow eaters, respond fairly quickly to food. Any dealer who really wants to sell his fish will agree to do this. Otherwise walk away. Other information you need to obtain is how long the dealer has had the fish (less than two weeks suggest that they may not be fully quarantined), where they originate from (import or bred in-house), and if they have been subject to any medication or de-worming cures? Any decent dealer will have an immediate answer to such questions - and it will give you an idea of the fish's history as well as the dealer's knowledge. Finally, remember to ask about the water conditions the fish are in, so you can make sure your aquarium offers the same conditions before bringing the fish home. If this is not the case, go and make the necessary changes to your water, before bringing the fish home. Again - if you have seen the fish you want - put down a deposit, and go back a couple of times to check on their conditions, while you're in the process of changing things. It's another chance for you to make sure that the fish you're buying is in good health. If possible - buy medium sized Discus Fish - adolescent in want of a better word. The reason for this is that they will find it easier to adapt to a new environment than older fish, and they do not require as many regular feeds as the young growing Discus. Seattle Aquarium, Pier 59, Seattle, Washington. The building has a city landmark status. Seattle Aquarium provides a map of the marine sanctuary they are maintaining. Visiting Seattle Aquarium is the best destination for educators, parents, kids and visitors from other places searching for undersea information. You can see and enjoy real marine life adventures through availing of their specialized teachers' programs, field trip events and opportunities and other marine resources. Everyone enables to learn so that their knowledge can be shared with more people cultivating their awareness about protecting the marine environment. Seattle Aquarium is an ideal place for marine science camps. They are offering either a full or a half-day camp programs for children ages six to twelve years old held during summer, spring or winter school breaks. Parents could find the right camping programs appropriate for their children’s interest in marine life. Seattle Aquarium does their best to incorporate knowledge on people interested in the marine world providing different opportunities for learning such as art contents for kids, aquarium classes or giving resources and workshops for teachers. They are also offering programs suitable for parents and children giving them the chance to explore and learn about marine life. Your visit to Seattle Aquarium is well compensated. You can become a member to get an unlimited admission while supporting the Seattle Aquarium mission. Their admission fees are amazing and whether you regularly visit Seattle Aquarium, you can always find something new to explore because their exhibits are changing constantly. Seattle Aquarium has gift shops stores where you can find high-quality products and books for enhancing your experiences regarding aquariums.